Yesterday Enrique shared his views. Richard commented that the spelling and typing were very good. I would have to agree. Today, we will be hearing from Zaul, also in my 5th period. I have gone ahead and enhanced the images using GIMP rather than wasting time rescanning each page. This sould be much more readable. I'm enjoying the students' thoughts on typewriting, keep them coming. I have plenty to share and plenty more coming. I am glad you're enjoying them. 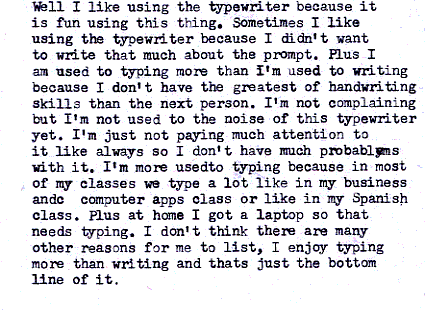 I just got this e-mail from one of my own students: "Is it difficult to find the parts (ink) to a typewriter? I have been interested in getting one because I like having to press on the keys harder than a keyboard and the sound of letter striking the page. I also like the idea of having to get the word correct and the old-timeyness. I also like the way the font looks and the sort of community of typerwriters."